BATON ROUGE -- Blane Salamoni, one of the Baton Rouge police officers involved in the shooting death of Alton Sterling, is among defendants in a new federal civil rights lawsuit alleging that he and another officers repeatedly struck Ja'Colby Davis in the head during the teenager's arrest at Baton Rouge's 2016 Earth Day celebration. Davis' family says in the suit that three unnamed officers pinned him to the ground while Salamoni and Sgt. Todd Bourgoyne administered a "brutal beating" and arrested the 16-year-old "without cause." Shannon Battiste, the attorney representing Davis and his father, Wayne Davis, is seeking a jury trial and $2 million in compensatory and punitive damages. East Baton Rouge Parish Attorney Lea Anne Batson would not comment on the suit Wednesday (Jan. 11). She said Deelee Morris, an attorney in her office, would likely handle the case for the city. 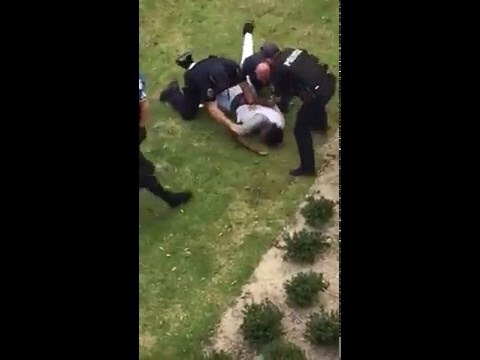 Video of the Earth Day arrest shows a police officer repeatedly striking Davis in the head while other officers pinned him to the ground near the Baton Rouge River Center. Salamoni is not the officer seen hitting Davis in the 13-second video, first published by The Rouge Collection and shared widely on social media. Police have confirmed it was Bourgoyne, who was placed on two-week paid administrative leave while officials investigated the April 17 incident. Ultimately, an internal affairs complaint against Bourgoyne was "not sustained," meaning Chief Carl Dabadie Jr. decided there was not enough evidence to either exonerate or sustain the charge, according to a Police Department spokesman. Police officials and the then-president of the officers' union, Sgt. Chris Stewart, said shortly after the incident that the video was misleading and didn't show the entire event, and that Davis struggled with police while resisting arrest. East Baton Rouge District Attorney Hillar Moore, who decided not to prosecute Davis on charges of battery of a police officer and resisting arrest, said Wednesday he would not comment on the case because Davis is a juvenile. The lawsuit says Salamoni, who wrote Davis' arrest report, was the first officer to approach the teen, asking him to "step back from the area" and later grabbing the Davis by the arm and driving him "violently into the ground." Both Bourgoyne and Salamoni admit to striking Davis during the arrest, the suit says. Davis, "after receiving such a brutal beating," according to the lawsuit, received medical treatment at Our Lady of the Lake Regional Medical Center before being taken to the Juvenile Detention Center. Salamoni is currently on paid leave while the FBI and U.S. Justice Department investigate the July 5 fatal shooting of Sterling in the parking lot of the Triple S Food Mart. An announcement is expected later this month on whether criminal charges, under the federal civil rights law, will be filed against Salamoni or Howie Lake II, the two police officers involved in the deadly shooting.